The industrial internet of things (IIoT) and Industry 4.0 are already unleashing enormous value in plants around the world. It seems that today’s younger, digital workforce is the energy that propels this change. Past efforts had been sluggish to say the least. Modern consumer products have put connected devices in our pocket, on our wrist, in our ears, in our car and throughout our home. IoT is projected to deliver between $1.9 and $4.7 trillion of economic value by 2025. The IIoT for asset monitoring is expected to produce $200-$500 billion in economic value by 2025. 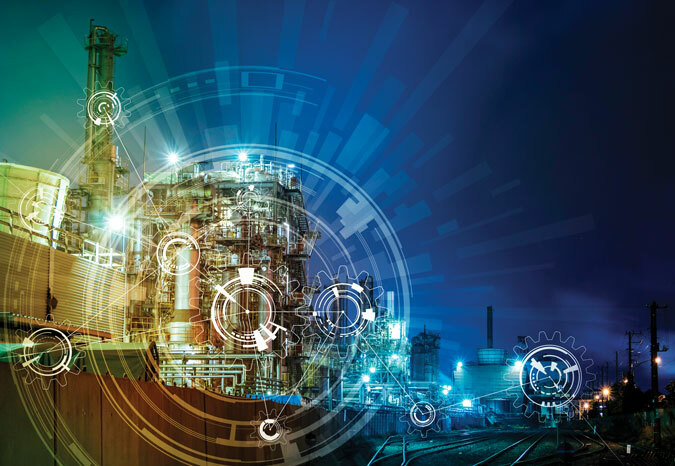 Condition-based maintenance (CBM), involving real-time sensing and predictive maintenance, is viewed as the “easy win” among all IIoT applications. Many new online sensors are being introduced each year (see Figure 1). in the condition monitoring space is impressive. field of condition monitoring forever. 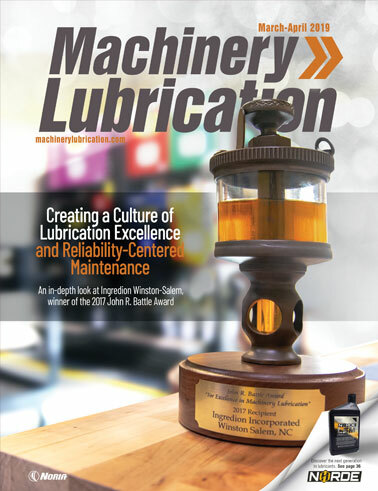 Condition monitoring describes the data collection function needed to sustain machine reliability. Intelligent machines and smart factories require the ability to respond and make agile course corrections to this data. Data analytics is the buzz term related to converting data into smart, actionable information. When used to foretell a future event, it often is referred to as predictive analytics. Either way, it takes condition monitoring one step further - a very important step. This could be called condition analysis. However, we’re not done, as we need the response piece. This is the function of doing something actionable (real-time course corrections) with this information. This is called condition response. But we’re still not done. We now need to return to condition monitoring to confirm that we have positive feedback to these actions. Did the course correction really work to remedy a problem or improve overall machine performance? Perhaps another course correction must be tested? The IIoT is a critical enabler that some say is long overdue. It implants sensors that are “tuned in” to the real-time dynamics of our machines. After all, the failure development period (P-F interval) can vary from milliseconds to years. The IIoT provides the continuous vigilance to the onset of anything that is changing and might compromise reliability and sustainability of our machines and processes. 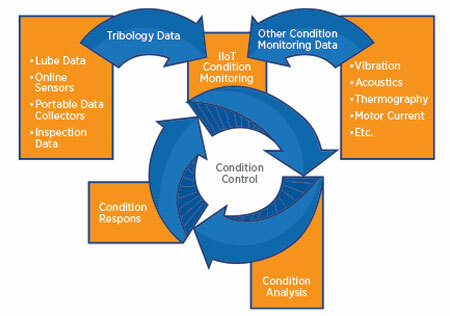 Figure 2 shows a simple illustration of the circular condition control process. 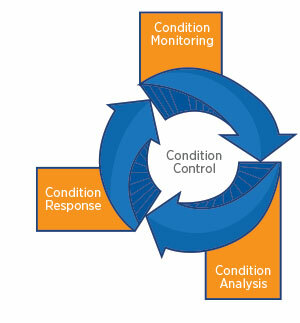 It’s time to morph condition monitoring into condition control. information about the state of the machine. humans or autonomously by the machine. Today, more and more machines are fitted with onboard “edge computing” or distributed intelligence. Data is still fed to the cloud or a centralized location, but decisions can be made locally. There’s also artificial intelligence (AI), which involves computers powered by sophisticated, self-learning software using algorithms that mimic human intelligence. AI is more common in consumer products but is still in its infancy in industrial product applications, especially condition monitoring. human executive condition control responses. More practical and effective is augmented intelligence. With augmented intelligence, the human’s super-computer (brain) teams with man-made computers to collect and convert data to actionable information. For instance, visual operator inspection data that is scanned or keyed into a handheld device can be augmented by pairing it with data generated from online condition monitoring sensors. See Figure 3 for a simple visual on augmented intelligence. In real time, this data can dictate machine control and movement to optimize and sustain machine health and operating conditions. These are like guidance systems that respond to current conditions, providing adaptive control in response to instant changes. The state of the machine is constantly monitored and recalibrated. 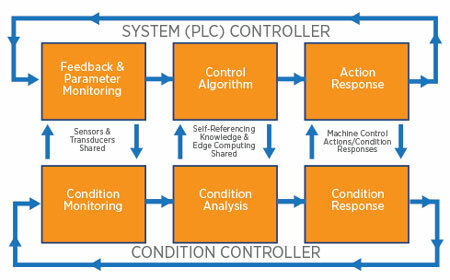 Real-time sensing can be shared between the system controller (like a PLC) and the condition monitoring controller. This provides a functional interface enabled by an IIoT platform for mutual benefit related to machine performance and reliability. 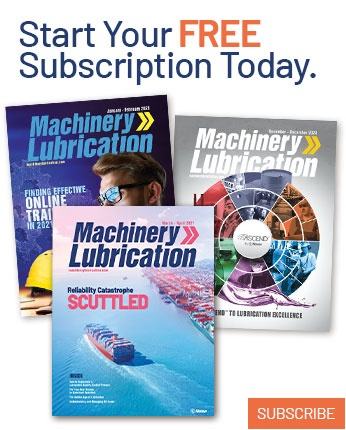 Machines with autonomous control features (current or potential) might include hydraulic systems, compressors, paper machines, turbines and many sophisticated process machine trains. The concept of coupling condition control with system control is illustrated in Figure 4. Of course, not everything must be done in real time. Because of the complexity of some machines and the technology limitations of many condition and operational control functions, both human and machine responses are needed. The IIoT and online sensors can supply the data, while data analytics can translate the data into prescriptive responses. However, the manner and time element of the corrective responses may vary. This hybrid model probably makes the most sense, as it is the easiest to deploy. But this is a dynamic field that will continue to evolve as technologies advance and machines become smarter and more agile. 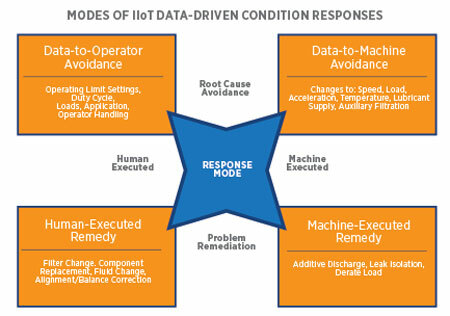 Examples of how humans and machines can work together are shown in Figure 5.
model shows the IIoT as the primary source of data. Oil is like a flight data recorder. It is exposed to the intimate innerworkings of the machine, seeing both the good and bad. It’s the common medium that records data from these exposures which might reveal health or aberrant conditions that can induce future failure. Decades of research in tribology and millions of oil analysis samples have taught us that there’s gold in our oil. The data that can prescribe needed actions is this gold. It is detectable and quantifiable. The means of data acquisition should not only be limited but also multimodal. It can be extracted from samples and analyzed in the laboratory, monitored in real time with online sensors, interrogated using portable data collectors, or examined by skillful and investigative inspectors. Other non-lubricant-related tests and inspections at the machine help complete the picture and establish greater confidence in what’s happening now (or not happening). The IIoT does not and cannot make all other forms of condition monitoring obsolete, but it is a powerful enabler. Data and information can reach the internet in a variety of different ways that don’t involve imbedded sensors. This data can pass through modems or industrial gateways for analysis and storage. As mentioned previously, the response to this data can be autonomous (i.e., machine executed) and human executed. See Figure 6. The foundational pieces of IIoT-enabled condition monitoring have been advancing rapidly for years. Recently, enough of the pieces have fallen into place that working systems are beginning to show solid results. Many companies are waiting as others are taking the lead. The full potential of IIoT-enabled condition control will evolve over the ensuing decades. While it is in its infancy when viewed in contrast to this full potential, some readers are young enough to see this potential transition to reality. Promising careers will exploit this potential, as will new and emerging companies. The field of machine reliability has an exciting, technology-rich future. It should be a great ride. Agility is fundamentally important. The ground is always shifting (figuratively), and the machine must be agile and shift in response. It’s like climate control. When it’s hot outside, the air conditioner responds. When it’s cold outside, the heater responds. Sustained machine reliability depends on agile responses to operating conditions and exposures to all things that present risk and impair reliability.